There are some bands, that despite being on my radar at the time, completely managed to pass me by. Dead Can Dance was one of those bands, who along with the Cocteau Twins managed to build the iconic, sepia-toned aesthetic of 4AD Records. The politics of record labels, domestic and foreign distribution rights, and other seemingly antiquated notions in this digital internet age, but are ultimately what shaped 4AD’s forage into the North American market through a distribution deal co-founder Ivo Watts-Russell inked with Warner Bros. I was vaguely aware of this at the time, because of a program called mIRC (“Internet Relay Chat”)–a chat program that seems crude by today’s standard. It was there that I met many of the people I would trade mix tapes with…one in particular was cataloguing every aspect of 4AD, which is how I came to learn of Dead Can Dance. I would soon grow to love bands like the Red House Painters and Mojave 3, but mostly how cohesive their catalogue seemed to be. Little did I know Dead Can Dance would come to be categorized as “world music”. 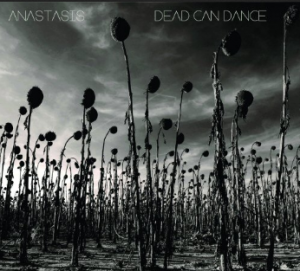 Anastasis, DCD’s first release since 1996 definitely has elements of that, but I find it interesting to note that over the past few decades, it has attracted a mostly industrial/goth audience. Listening to their earlier material there is more of that feel to it–Anastasis is sadder, slower, and accompanied by a chamber orchestra. But it also manages to create what most good albums strive for: rich atmosphere. There’s no question that the pace of this album is a plodding one–Perry carries the duty of most of the heavy lifting with the vocals, and the usual gongs, sitars, trumpets, sitars, and strings. In short, there’s no shortage of an audio sensory overload here with lots to keep you occupied. At least no one can accuse them of going small or under-ambitious. Amnesia is one of the stronger tracks off the album, reminiscent of Frankie Goes to Hollywood’s Power of Love (I mean this in the best way possible), only carrying bone-crushing weight. The meaty middle portion of the album continues with the Middle-Eastern-y Gerard-voiced Kiko…but it’s really Opium that stands out to me as having the best arrangements off Anastasis. Strings and percussion play nicely together here. The album finishes with the Isle-influenced Return of the She-King that might appropriately score an epic Irish Springs commercial and All In Good Time. I think the important thing to note is that DCD has stayed committed to achieving a flavor with this work, and they have managed to do so, with some epic song-writing arrangement-wise. In thinking about Dead Can Dance, Perry and Gerrard’s former relationship, trans-oceanic break-up, and 16 year hiatus, I’d be hard-pressed to think of any better build-up to tonight”s concert at the Sony Centre for the Performing Arts (the Hummingbird to the rest of us). If you need any confirmation of the way their music will play out in a theatre’s acoustics, you need only look at the long string of sold out dates on this world tour.